In this post, I will be talking about the steps involved in deploying your PhoneGap app to your iOS device using XCode. Bear in mind that if you only want to test your app functionality, you can do so in the iOS Simulator available within XCode. However, for whatever reason, if you want to actually test your app on the actual device, you need to generate a .ipa file and a mobile provisioning profile. To be able to create a provisioning profile, you need to enroll to the Apple iOS Developer Program (costs $99/year or £59/year if you are in the UK). In this post, I won’t be going into the details of how to create a provisioning profile using Apple’s iOS Provisioning Portal – I will assume you already have a provisioning profile. So, let’s get started. Once you do this, you will notice that the list of devices in the top left will now show up your connected device as well, apart from all the simulators. You will notice that once you select your device in the list above, the “Product -> Archive” menu item will be enabled (it is disabled if you have any of the simulators selected). Hit the “Archive” menu item and XCode will then sign your archive using the certificate in your keychain and create an archive file. The file will be named something like PhoneGapTest 24-11-2011 22.32.xcarchive. 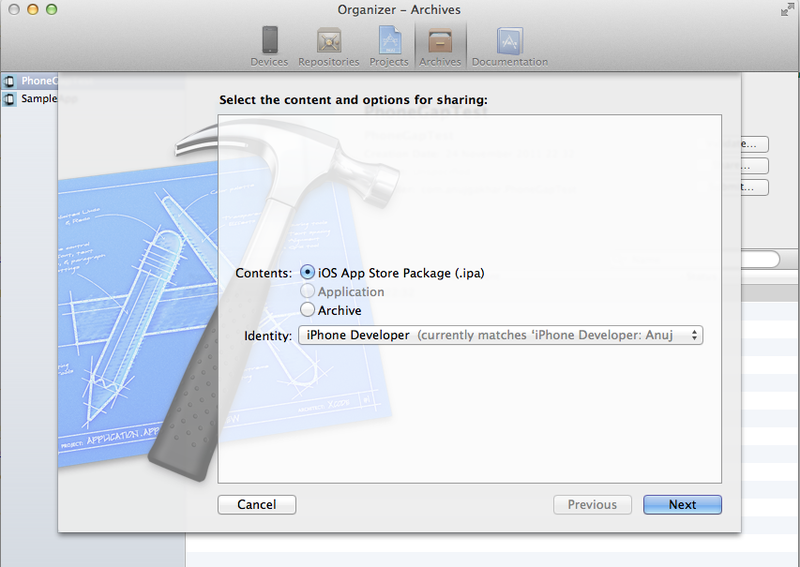 Once you have created the Archive, you need to go to the Archives Section in the XCode Organizer window, select your archive and then hit “Share”. Now you will get the option to create an .ipa (iOS App Store Package) and your provisioning profile will automatically be selected in the dropdown. If not, you can choose the one that applies to this app. At this point, you can select where you want to store your .ipa file. Once this is done, you can now drag/drop you .ipa to iTunes and then your provisioning profile (.mobileprovision file) as well, Once that is done, iTunes will copy the app to your device. Or you can manually hit “Sync” to do that if iTunes does not do it automatically. I know this is not a very straight forward process as compared to copying an app to an Android device e.g. but I think Apple just wants to know about each and every device that is being used for development (by asking for the device UUID in the provisioning profile creation process). I am learning all these processes as part of my mobile development journey and I will be posting such information here as and when I find something worth blogging. The “how to” for provisioning profiles on the apple developer page https://developer.apple.com/ios/manage/provisioningprofiles/howto.action isn’t suitable for xCode 4.2.1! Great post better than on aaple-developers site,can you explain what does provisioning profile exactly do or why do we need to create it? I am able to transfer my app on my device but it crashes,i have no idea why is it happening and neither i am able to create its ipa file as i don’t have any provisioning profile,can you plz help me with it?? Thanks for the article, it helps for beginning iOS programming. I do this the easy way: just drag the .app file which is created by “Project / Build for / Testing” to the “Applications” section in Organizer (under my device).